On a weekend outing recently I had the honor to meet an inspiring , charming Greek man whose family owns olive groves in Greece. The family produces some of the best olive oil I have ever tasted. Pure, green, fruity, this oil is unlike anything you have ever tried. The oil is extra virgin, undiluted. This means this oil is from the first cold pressing of ripe olives. The category of extra virgin olive oil is required to have an acidity of .o8%. Theros Undiluted Extra Virgin Olive Oil is .045%. If you are lucky, you will get a bit of the denser oil that filters to the bottom of the barrels. There is a very small amount of this because most of the oil is drained off and bottled in the clear state. Because the oil is undiluted, more of the ‘solids’ will fall to the bottom of your bottle. Shake it up if you like or save it for an ultimate treat near the end of your oil. Theros also produces and sells unfiltered olive oil. When we were children, we lived in Seville, Spain for a few years. My mom would slather us kids in olive oil and tell us to go play outside for a while. After we would come in, bathe and go to bed. Our skin and hair were so smooth and lovely. I remember the distinct aroma of the rich olive oil on my skin. I loved it. When I smelled Theros oil, my memories of Spain came flooding back, the rich ripe aroma of olive oil. I wanted to slather it and go play. Amazing, we were brown as berries but we never worried about sunscreen then, and didn’t get sunburned. Mostly anyway. Why be so limited when the world has become so accessible? Here is a way to extend the boundaries of local to include the world. In this case Greece. Who can say no to Greece? The Greek economy is in pretty bad shape now. In a small way, buying olive oil helps support the families who grow and harvest the olives. In small ways, each purchase can help the Greek economy. Small yes, but it is something. The Italians have had such a world-wide demand on their olive oil, most of what you find in common supermarkets can no longer be trusted to be quality olive oil of any grade. olive oil from anywhere else but Italy. However, with the olive oil awareness and a more sophisticated demand by consumers, your chances are improving that you will find other countries of origin. A few days ago I tested this theory in my local grocery and was pleasantly surprised to find 1 brand of Greek olive oil and 1 brand of Spanish – the rest were Italian. 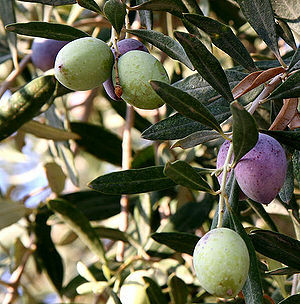 Greece is ranked second in the European Union for their production of olives – 147,500 tonnes in 2010. 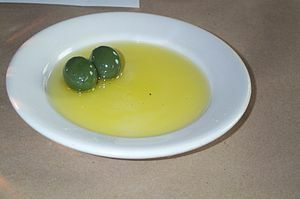 I do not know how much was pressed into varying grades of olive oil vs being brined to eat as olives. It would be extremely interesting to take a sabbatical from work and go harvest olives in Greece, take the olives to be pressed and learn about brining olives to make them palatable. Then to France to harvest grapes. What a fall that would be! 6 winners will be chosen based upon meeting all 4 criteria above. We will choose the most creative and delicious ways you use olive oil. Winners will be chosen by a panel of Spoon Feast advisers. All domestic and international shipping arrangements will be made directly with Theros Olive Oil. You will have until Friday, June 15th to participate! Winners will be announced on Sunday, June 17th. Treat yourself, Check out Theros Greek Extra Virgin Olive Oil! 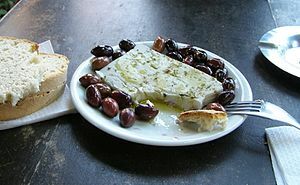 This entry was posted in Building Your Community, Cooking, Cooking Thoughts, Making a difference, What every good cook should know and tagged extra virgin olive oil, food, Greece, greek olive oil, Olive, Olive oil. Bookmark the permalink. I love olive oil just right out of the bottle on some butter lettuce with kosher salt and fresh ground pepper. It’s not fancy, but it’s fantastic! I also love olive oil with some fresh herbs and a little (okay, a lot) of crusty french bread for dipping! Thanks Teri, it is so good just as it is! lovely. I like olive oil cause…. I’m Italian 🙂 it is true, a lot of Italian olive oil uses olives from different countries. that’s why it is important to invest in small productions. Italian quality olive oil IS to be trusted. but of course I spoke of investment for a reason… it is expensive. good you are trying to help the Greek cause. It is really sad what’s going on there (and in Italy it is not going so much better right now). I agree, Italy has been hit hard with the earth quakes and their economic situation isn’t much better. Small production Italian oils are truly superb! All small productions are really special. It is the huge producers that have started ‘blending’ that have confused consumers for the sake of profit. I am so glad artisan producers still exist. You are welcome! It is great olive oil. My favorite olive oil by far is the La Boella Arbosana!